Description: BBC 1981; olive green hardcover in decorative dust jacket; 192 pages including index; b/w and colour illustrated. Synopsis: Seven prominent B.B.C. writers and presenters describe their varied and different Railway journeys as follows: India: Deccan by Brian Thompson. South Africa: Zambezi Express by Michael Wood . Australia: The Long Straight by Michael Frayn and Dennis Marks. America: Coast to Coast by Ludovic Kennedy. South America: Three Miles High by Miles Kington. Britain: Confessions of a Trainspotter by Michael Palin. Europe: Changing Trains by Eric Robson. Notes on the contributors and picture credits connclude the text. Condition very clean, firm and good. Mary Ward Books is an independent online bookstore specialising in second hand, out of print books and used books such as Great Railway Journeys of the World by Michael Frayn and others. We offer a book search facility and secure payments via PayPal and Nochex. Mary Ward Books is based in East Anglia, United Kingdom. We were established in 1997 and have been selling books online since 2002. 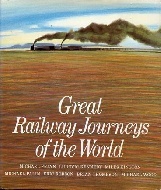 We ship worldwide, please click here to see our shipping charges for Great Railway Journeys of the World by Michael Frayn and others. We have many other books in our Railways & Railway Memorabilia section for sale of which below is a selection - Please feel free to browse them or press the 'continue shopping' button below to see the entire Railways & Railway Memorabilia category.